Bueno, chicos, ocurrió un giro inesperado en los acontecimientos en torno al inminente ataque punitivo de la NATO en Siria (y el consecuente peligro de desatar una conflagración global). 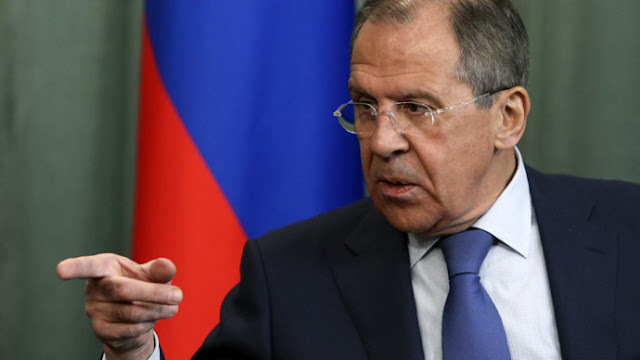 Rusia acaba de anunciar, por medio de su ministro de Relaciones Exteriores Sergei Lavrov (foto) que tiene pruebas “irrefutables” de que el ataque químico en Guta fue una operación de “bandera falsa” a cargo de servicios secretos del… Reino Unido! Texto: As the blame game over the alleged chemical attack in Syria escalates ahead of what is expected to be an imminent, if contained, air strike campaign by the US, UK and/or France against Syria, on Friday morning, Russia's foreign minister Sergey Lavrov said Moscow had "irrefutable evidence" that the attack - which allegedly killed more than 40 people in an April 7 chemical weapons strike on the former rebel outpost of Douma -was staged with the help of a foreign secret service. Speculation that said "certain state" was the UK was confirmed shortly after, when Russia's defense ministry alleged that Britain was involved in the suspected chemical attack. According to defense ministry spokesman, Major General Igor Konashenkov, the Kremlin has evidence that Britain was behind the attack. As RT further adds, the Russian Defense Ministry presented what it says is "proof that the reported chemical weapons attack in Syria was staged." It also accused the British government of pressuring the perpetrators to speed up the “provocation.” During a briefing on Friday, the ministry showed interviews with two people, who, it said, are medical professionals working in the only hospital operating in Douma, a town near the Syrian capital, Damascus. On Wednesday, Russia made the first allegation that the chemical attack was staged by Western powers, in this case by the infamoous "white helmets," a US-funded NGO lauded by mainstream media for their humanitarian work, while long-suspected of performing less-than humanitarian deeds behind the curtain. "But we've seen them on the video!" responds EuroNews correspondent Andrei Beketov. "There was no chemical attack in Douma, pure and simple," responds Chizov. "We've seen another staged event. There are personnel, specifically trained - and you can guess by whom - amongst the so-called White Helmets, who were already caught in the act with staged videos." Russia said previously that it sent experts in radiological, chemical and biological warfare - along with medics, in order to inspect the Eastern Ghouta city of Douma where the attack is said to have taken place. Russia's Defense Ministry said in a statement that the experts "found no traces of the use of chemical agents," following a search of the sites, adding "All these facts show... that no chemical weapons were used in the town of Douma, as it was claimed by the White Helmets." In any case, if Russia indeed has "irrefutable evidence", it is probably just a matter of time before it is made public in an attempt to sway public opinion, ideally before the Syrian airstrikes begin afresh. If confirmed, it would be a major slap in the face of neo-con forces across "western democracies", if hardly a shock: after all the US using a fabricated pretext to wage war or simply to effect a much needed distraction from domestic affairs, in the middle east is a painfully familiar narrative. Meanwhile, as we wait for Trump to announce what happens next, late on Thursday we reported that US National Security Advisor John Bolton and Defense Secretary James Mattis are reportedly feuding over the strategy in Syria, with Mattis favoring a more cautious approach, even as France and Britain are crafting broad strike plans and are willing to pursue any military strategy, even though as noted, a readout of a Thursday phone conversation President Trump and UK Prime Minister Theresa May suggests that military action may be days away, instead of hours.